Are You Recruiting Board Directors With a 21st Century Approach? Over the last three years, I have conducted several nonprofit board recruitment projects. The boards with which I worked had rather similar challenges. •	They had concerns recruiting sufficient numbers of qualified board members to fill their needs. •	Current board members, largely composed of younger people, in the 30-40-age range, had significant problems balancing work and family obligations and attending board and committee meetings. •	Attendance was sporadic. Strategy discussions were continually sidelined or limited to development of a SWAT data. Although the boards were small, directors really did not know each other, and in once case, an elected director sent a working subordinate to attend board meetings. In another case, a well-regarded director never attended meeting and only occasionally met with the ED to offer advice. One director, with decades of experience on the board, admitted she did not know other directors. All EDs and board chairs had significant power. One ED complained she was doing the work of operating the organization and operating the board, leading to excessive potential personal liability. •	Although the organizations, with budgets in the $2-$10 million range were operating successfully, the EDs involved realized that they were in line for long-term problems if board recruiting didn’t change. •	Consider establishing two boards, a board for governance and a consulting board. For the governance board, make certain the typical directors in the 30-40 year age range that they have a good understanding of their work-family obligation to be able to devote time for the organization. 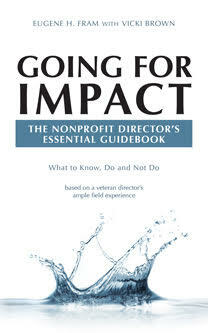 •	For the consulting board, ask volunteers to work on projects that have a defined time limit. They will not be asked to be involved in more than one or two projects per year, an ideal inducement for millennials who are used to short bursts of activities. It may be necessary to recruit several persons with the same skills to provide coverage for several projects. •	Keep communications flowing to the consulting board like one would to the governing board. Have social and educational events that allow the groups to meet informally. If the organization has a volunteer manager, this person should be charged to keep the communications flowing. Members of the consulting board will only have occasional contact with the organization. 1. Recently retired people, both those traditionally retired and those who retried early, who may have time to be candidates for both the governing and consulting boards. 2. Seek individual contributors who may have more control of their time, such as doctors, lawyers, professors and small business owners. 3. Seek successful entrepreneurs who can schedule their own time, can resonate with the organization’s mission, vision and values and who want to give back to the community. •	Beyond the time requirement, seek persons with experience on profit or nonprofit boards so they can share their board knowledge and become models for those having their first board experience. Their questions and modeling behaviors can teach as much or more than formal seminars. Have a mentoring system for continued education. The traditional nonprofit board skills grid can still be helpful in the 21st century. However it needs to incorporate lifestyle and behavioral information, as shown above for each board candidate, and a consulting board needs to be considered for many with work-family challenges. Directors lifestyle and behavioral characteristics, when added to skills, can open new vistas for considering director candidates. ← Is Excessive Deference Shown To Nonprofit Boards?